Education • Computer-adaptive testing will replace fill-in-the-bubble method next spring. 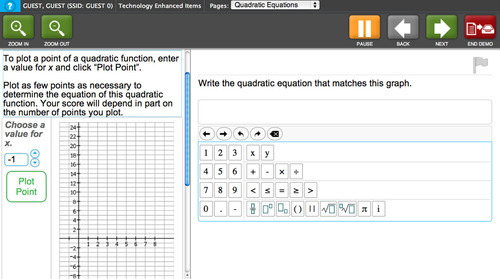 This is an example of what a math question might look like on one of Utah's new SAGE computer-adaptive tests. The questions will often ask students to demonstrate knowledge rather than providing multiple choices. In the future, Utah parents will tell their incredulous children about the days of pay phones, VCRs and dial-up Internet. Fill-in-the-bubble tests in schools will soon join that list. Across Utah, students are facing their last Criterion Referenced Tests (CRTs), multiple-choice assessments, taken by computer for the past couple of years. Next spring, they&apos;ll see a new computer testing system called SAGE (Student Assessment of Growth and Excellence)  which adapts to their strengths and weaknesses. If a student answers a question wrong, the next question will be easier; if he or she answers correctly, the next one will be harder. It&apos;s just one of many dramatic changes in how Utah tests students that has some educators excited, an eagerness they&apos;re hoping parents will feel as well. "All the evidence and results have suggested [adaptive testing] is a better way to assess students," said Judy Park, state associate superintendent. Park and other state education leaders have presented the new system to teachers and parents at 20 public meetings across Utah, ending their tour last week. One of the biggest changes  for those who remember taking standardized tests with a No. 2 pencil  will be a serious decline in multiple-choice questions. Under SAGE, students won&apos;t always be able to guess between A, B, C or D.
Instead, a reading question might ask a student to demonstrate an idea by highlighting, dragging and dropping a sentence from a passage into an answer box. A math question might ask students to plot x and y coordinates on a graph and then type the corresponding equation. "This way, they&apos;re kind of starting with a blank [page] and having to demonstrate what they know," Park said. But perhaps the biggest change for educators is the information these tests will give them. For years, teachers have given CRTs once, toward the end of each school year, to assess their students&apos; proficiency in math, language arts and science. Teachers will still give SAGE tests in the spring, but they&apos;ll have the option to give them in the fall and winter as well so they can see students&apos; progress. The testing system will also include formative assessments  a term for the informal exercises, instruction and quizzes students and teachers work on daily. SAGE will direct teachers to particular exercises based on each student&apos;s needs. "As a teacher, I celebrate it because it&apos;s a more accurate reflection of what a student knows," said Sandra Carmony, an administrative intern at Clearfield&apos;s Wasatch Elementary who attended a recent informational meeting on the tests at Davis School District headquarters. Kim Rathke, a National Board-certified English teacher at Central Davis Junior High in Layton, said she&apos;s excited to use SAGE after watching kids guess their way through tests for years. "I actually think it&apos;s fabulous," said Rathke. "We&apos;re finally testing what the students know." The new tests will reflect Common Core standards, adopted by Utah and most other states to better prepare kids for college and careers by outlining concepts and skills students should learn in each grade. Curriculum is left up to teachers. Utah leaders, however, began talking about adopting computer-adaptive tests years before the standards emerged. And in recent years, they&apos;ve been piloting the tests in a number of school districts. For six years, the Sevier School District has been using computer-adaptive tests developed by a different company than American Institutes for Research, which Utah is paying $39 million to take the tests statewide. Myron Mickelsen, Sevier superintendent, said the tests have been successful, citing high achievement by his district&apos;s high schools as compared with others. "There&apos;s no question computer-adaptive assessment is a way to improve [instruction] and help educators understand where those improvements can be made," he said. Stanley Rabinowitz, director of the assessment and standards program at WestEd, a nonprofit, California-based research and development agency, said some have questioned whether adaptive tests are effective for all groups of students, but he said they&apos;ve been proven to work. "I think Utah is on the right side of history on this," said Rabinowitz, who also serves on a Utah committee that&apos;s helping to implement the tests. Both Rabinowitz and Park added, however, that scores may dip under the new tests because Common Core standards expect more from students. And no test is a perfect indicator of classroom success, Park said. To find out more about the tests and see the contract between the State Office of Education and the American Institutes for Research go to tinyurl.com/c9caal5. To see a demonstration of how some of the new test questions could work go to demo.tds.airast.org/AIRAssessment/.